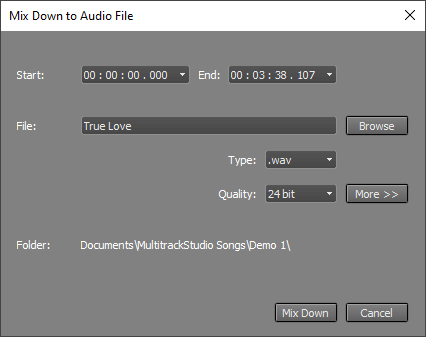 This Mix Down menu's Mix down to audio file option can be used to mix down the current song to a single audio file. The Start and End boxes determine the part of the song that is going to be mixed down. The down arrows next to the boxes can be used to load marker positions. The Browse button invokes a standard file save dialog. The File box displays the file name. You can change the name without using the Browse button as well. The Type box lets you choose the file type (.wav, .mp3 etc.). The Quality box is available if the file type offers multiple audio qualities. An additional Include Varispeed button is visible if the Pro edition's VariSpeed setting does not equal zero. This button is engaged by default, so the VariSpeed's effect is applied to the file. Speeding up a song slightly to make it a bit catchier is a widely used trick. The More button unhides some advanced settings. The Channels box can be used if you want to mix down to a mono file. The Samplerate box can be used to make the audio file's samplerate different from the song's samplerate (eg. to mix down a 96 kHz Song to a 44.1 kHz file). The Noise Shaping button can be used to avoid applying noiseshaping to the dither signal. If the Remember Folder button is engaged the current folder will be used by default when the "Mix down to audio file" appears. If it's not engaged the file will be placed in the folder the current song is in by default. Note: Any MIDI tracks using an External MIDI Instrument should be recorded to audio tracks before mixing down. The Mix Down menu's Playback mixed down file option closes the current song, and loads the audio file created using the "Mix down to audio file" option in a new song. You can browse for an audio file if there's no mixed down file available (i.e. in case the "Mix down to audio file" hasn't been used since opening the current song). Note: the track's volume fader is set to +3dB automatically to compensate for the 3dB attenuation caused by the pan knob.